A map of China’s shifting definition of the so-called Nine-Dash Line. A British geographer and journalist described China’s claims to large swaths of seas and land formations off its coast are based on 20th-century events — from the Boxer Rebellion to the defeat of Japan in World War II — and not deeply rooted in its history. This assertion brought several heated questions from the audience. Bill Hayton, an associate fellow at London’s Chatham House and the author of South China Sea, The Struggle for Power in Asia, named one of The Economist’s Books of the Year in 2014 and a journalist with the BBC said in response to a question that Beijing’s claims are valid “because [these territories] are ours” historically, said “a hundred years ago you [Chinese citizens] wouldn’t feel” the same way. His previous book Vietnam: Rising Dragon describes the diplomatic, social, political, and economic issues facing modern Vietnam. Hayton has presented widely on the South China Sea and other Southeast Asian issues in Indonesia, Malaysia, the Philippines, Singapore, the United Kingdom, and the United States. Speaking Thursday at the Center for Strategic and International Studies, a Washington, D.C. think tank, he added, now, “every Chinese child is taught James Shoal is the southernmost part of Chinese territory.” The shoal is under water and claimed by China, Taiwan and Malaysia. It is more than 1,000 miles from the Chinese mainland and 50 miles from the Malaysia coast. The CSIS Asia Maritime Transparency Initiative and the Southeast Asia Program are pleased to invite you to a discussion with Bill Hayton, associate fellow at Chatham House. Hayton will argue that the current tensions in the South China Sea can be traced back to the muddled origins of China’s claims in the early twentieth century. He will show evidence that China’s claim to islands in the South China Sea emerged in 1909 and was further developed after 1933. He will explain how Chinese academics and officials came to draw the “U-shaped line” by copying Western maps—and in the process incorporated mistakes and misunderstandings with consequences that still trouble the region decades later. In answering a question about whether the media are increasing tensions over the disputes in the East and South China Seas, Hayton said, “The story has shifted” from one of China’s claims in the early 20th century in disputes with Japan and France over pieces of territory to one of who has the most influence in the region — Beijing or Washington. He said the international arbitration panel’s recent ruling against China in a dispute with the Philippines over its so-called “9-Dash Line” territorial claims fell within the rules laid out in the United Nations Convention on the Law of the Sea that the Spratlys were not islands. Hayton added that Beijing was an early and strong supporter of the treaty “to stop countries from” making territorial claims like the ones it made in the case over the Scarborough Shoal brought by Philippine case. 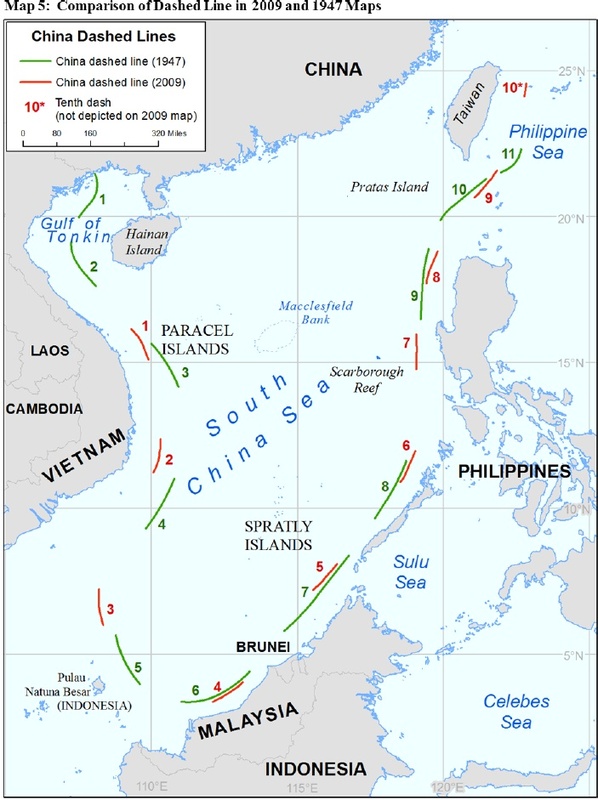 The first time the “9-Dash Line” appears in an official document is 1946″ and includes the Spratlys in a 1947 map, he said. They indicated certain land features also claimed by Japan, Korea, Malaysia and the Philippines were under its control. The “line,” which has shifted several times, was to make the territory appear to be contiguous. The imperial government was trying to regain control of its own affairs and territory, usually close to the mainland, and solidify support with its people. Later Chinese Republic officials continued these moves by “sticking in flags” on the Paracel Islands and sticking “one in the eye for the Japanese or anyone else,” who didn’t respect its sovereignty and claims. At the beginning of his presentation, Hayton said China’s claims in the disputed waters “are just as incoherent as others” to these islands, reefs, barriers and shoals. He said Beijing is making these claims out of a “sense of entitlement,” which shows no signs of going away.